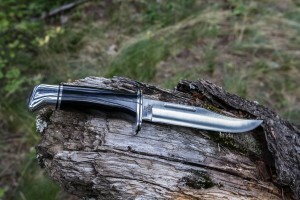 Buck 119 Review - The Best Hunting Knife? If there are any legendary hunting knives, one of them has to be the Buck 119 fixed blade knife. Without any further ado, let’s take a look at what this knife has to offer. As I already mentioned, the 119 model is of fixed blade and full tang contruction. Overall it’s just over 10 inch long and weights about 7.5 ounces. I can say the knife feels very balanced and its low weight allows prolonged use without straining ones hands. Thanks to its low weight, it can also be used easily for skinning and other delicate work although a smaller skinning knife may come in handy as well. Click here to check the Buck 119BKS on Amazon! The 6-inch long blade of the knife is made of the 420HC steel. Most people would say that the 420HC steel is not the best you can get, but it offers some advantages – it’s easy to sharpen, durable during constant use, it’s harder that stainless steel, and last but not least it’s quite cheap. Over the years the Buck 119 knives were made of various steels, but currently all of the models are made of the 420HC steel. As you can see in one of the added pictures floating around this article, the engineers over at Buck Knives designed the blade to have a clip point. 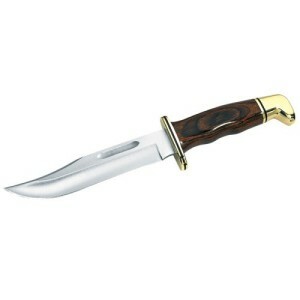 This is a traditional design, which is utilized by many other hunting knives. If you are not familiar with the various point designs, the clip point provides faster and deeper puncture. On the other hand, it’s also slightly weaker than the drop point. What you can ses as well, is that the blade has a stain finish. I personally like that. The handle of this model come in various materials. There’s not much to say baout the basic resin and wood versions. These materials are not particularily good choices for anti-slippery handles. In my opinion the wooden handle looks much better thant the black phenolic one. The wooden version is also accompanied by brass pommel and guard whereas the plastic one is equipped with silver features. If price is an important factor for you, then you need to know that the coccobola dymonwood handle model is priced about 40 bucks higher than the plastic one. On the other hand, if money is not an issue, you can also take a look at some of the special editions of the Buck 119 knife, which feature various handle materials and designs. Most often the handle is made of elk stag antlers. I won’t dive into too much details becuase these editions cost way too much money for my liking and ther availability is really limited. If you are interested, you can check them here. The knife comes packed with a genuine leather sheath. It holds the knfie securely and looks to be built from good quality leather. Some other retailers are offering this knife also with a nylon sheath. It’s slightly cheaper but I’d say that it doesn’t look as good as the leather version. Overall, the knife has been received very well by the customers. At the time of writing, the Buck 119 had over 600 customer reviews on Amazon and was rated very highly. To see the current rating, you will have to visit Amazon’s sales page. I’ve gone through a large number of the buyer reviews and most of the people seeemed to praise the knife for its razor sharp and easy to sharpen blade. Some of the customers have been disappointed by the size of the knife. They found it to be too large for their needs. However, this is not the fault of the knife itself, is it? Overall this is an excellent hunting knife that has been around for about 40 years. It’s the true legend. While some of the customers are saying that it’s no longer as well made as it used to be in the past, I still think, it is an excellent knife. If you are looking for a classic looking huntig knife, then this is the one to consider. It’s great and doesn’t cost a fortune either. Click here to buy the Buck 119BKS on Amazon!